This week, as the weather turned colder and autumn leaves began to fall in my neighborhood, my thoughts have turned to winterizing our home. I suddenly had a vision of our basement furnace where, I realized, I hadn’t changed our furnace air filter for a few months. I hurried downstairs and, sure enough, it was a sight to behold. 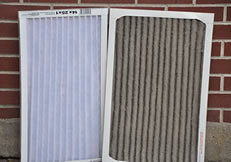 The old filter was so clogged with dirt and lint that it was amazing that any air flowed through it at all. With a clean filter installed, the furnace now hums along happily. Remove the clutter of negative influences in your life. If the news gets you down, turn it off and replace it with upbeat music or motivational CDs. Avoid people and places that tend to drag you down, emotionally. Then, create a positive atmosphere by spending more time with upbeat people, books, music, and messages. Review your goals. If you keep your goals constantly in front of you, incoming messages that conflict with your goals will automatically be filtered out. Focus on what is good in your life. Your mind can only focus on one thing at a time. So, if you keep your mind on good things, negative input is less likely to get through. Rather than allowing yourself to be paralyzed by fear and worry, take action. Replace fear with faith. Nothing will help you feel better than taking positive action toward worthwhile goals. Success Tip: Periodically clean your mental filters to avoid negative input and keep your focus on exciting possibilities. Way cool! Some extremely valid points! I appreciate you writing this. This message is so on point with what my clients need to hear. In fact, it echos our class disscussion from yesterday 21Oct09. Now that this is in writing from a different source other than myself, perhaps my clients will recognize this is truth and not just the teacher preaching. Thank you!